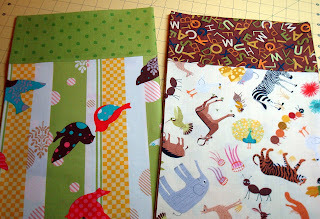 Squash House Quilts: Cute as a Bug! Today is the day my new Gammill arrives, but not until mid-afternoon. So yesterday and today I've been keeping very busy to keep my excitement under control - and it isn't easy to stay calm! Jackie at Canton Village Quiltworks has been been calling out for pillowcases for her Hole in the Wall Gang project. I thought I would contribute to the effort! She has a terrific easy and fast pattern on her website for the cases. Here are two that I made. The one on the left is It's a Hoot by Momo and the other is Animal Alphabet Flash Cards by Red Rooster. I think I might just raid my stash and redecorate our beds with new pillowcases! 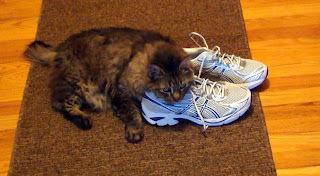 When I was on my daily walk yesterday I realized how badly I needed to replace my walking shoes. So, I went downtown and picked out a new pair. Before I put them away in the closet, Miss Sophie had to tell me how much she admired them! We're all ready for the Gammill! Mr. Squash and I will both be taking pictures. We've also made a nice plate of goodies for Jack as when he arrives he will have been on the road for 5-6 hours! We want him to be happy when he sets up the machine! Stay tuned! I'm so excited for you! I wonder if Jack is used to people taking pictures of their new machines as he installs and delivers! Those pillowcases are the cutest, but not as cute as Miss Sophie. Oh, I'm excited for you, too. I can't wait to read all about it. WOOO-HOOOO! I'm so exited for you!! Can't wait to see the pics and hear ALL about it! Pillows cases are so cute. The kitty pic is the best!! Oh my gosh how exciting!!! I can't wait. I'll have to be sure to check back in. I totally love Miss Sophie the super inspector. Now she's a cutie! Many hugs my friend. Missing you. *karendianne. Miss Sophie is adorable. I love to watch my cat "take possession" of anything new that comes into the house. Until it meets her approval the item is "just visiting." Waiting to see what beauties you produce with the Gammill. I just dont know how you can stand it.....I would not be able to anything in anticipation. You are so lucky! I am green wiyh envy. Looking forward to seeing your work on it. I'm sooooo excited for you! Hurry up, Jack! I want to see some pictures of the new arrival. Jack - OH JACK - where art thou? Jack - OH JACK - smile for the camera. Jack - OH JACK - we're waiting. Such an exciting day at yours! Woo Hoo!! My guy traveled something like 10 hours to get here from Vicksburg, MS. It amazes me how far they will come to deliver. Oh...and yes I could have used somebody closer but the closer shop wasn't friendly. I know there is lots of excitement in your house. Really fun pillow cases for someone to sleep on. I can't wait to see the new machine. How exciting! Thanks for the pillowcase shout out!! Your two cases will be loved by the little ones at the Hole in the Wall Gang camp. And you must post pics of your new little toy when it is all set up!! I know you will have fun! You have already had your exciting afternoon when you read this, and I hope everything went well. I believe the excitement will continue when you start excercing with your new toy. Have fun! I had to check back and let you know that I'm thinking of you and all your fun. No need to reply. Just know I'm thinking of you. I think Miss Sophie and Zinny would have a great deal of fun together! Cute pillowcases. Aren't they fun and easy to make. Learn to 'dance' with you new machine. That's what my distributor told me and his words were so true. Hope you don't have time to respond to this, due to quilting on your Gammill. Congrats to you. I am totally in love with your cat!!!!! !